Review posted May 7, 2018. Yes, this is the song from the film by the same name, illustrated in a picture book. It’s nice simply to have the words! But yes, the illustrations are what make this extra delightful. We’ve got seven children wearing the colors of the rainbow, some with umbrellas, some with hoods – enjoying the rain. There are fanciful elements. At some points, their umbrellas make them fly, and they get a trip through a rain forest. Other scenes show them enjoying puddles and rain in a city. The opening page has a girl dancing around a lamp post like Gene Kelly. 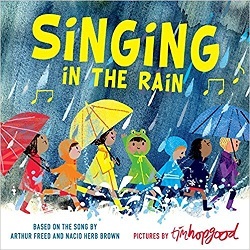 Apart from “Singing in the Rain” being the centerpiece of one of my favorite films, the reason I chose to illustrate this song is its underlying positive message. As adults, it is easy to forget the joy of rain. We tend to view it as an inconvenience rather than the wonderful thing that it is. Rain is something beautiful that connects all life, from the city to the rain forest. So next time it rains, don’t stay indoors. Go outside and soak it up like the children in this book. What a glorious feeling it is!